There’s something so perfect about the mix of royal blue, white, and gold, am I right? Sarah Richardson sure knows how to design a fresh and beautiful kitchen! This is Courtney writing this post today, I’m filling in for my mom since she came down with the flu (ugh) but I’m really excited to be here to talk about this GORGEOUS kitchen! You all know how much my mom LOVES Sarah Richardson! And I do too. I graduated last year with my degree in Interior Design, I love studying design as much as my mom does. And Sarah always inspires us! If I had to decide my favorite part of this kitchen, the brass accents would be a top contender. They add so much character and warmth to the space that would be missing otherwise. 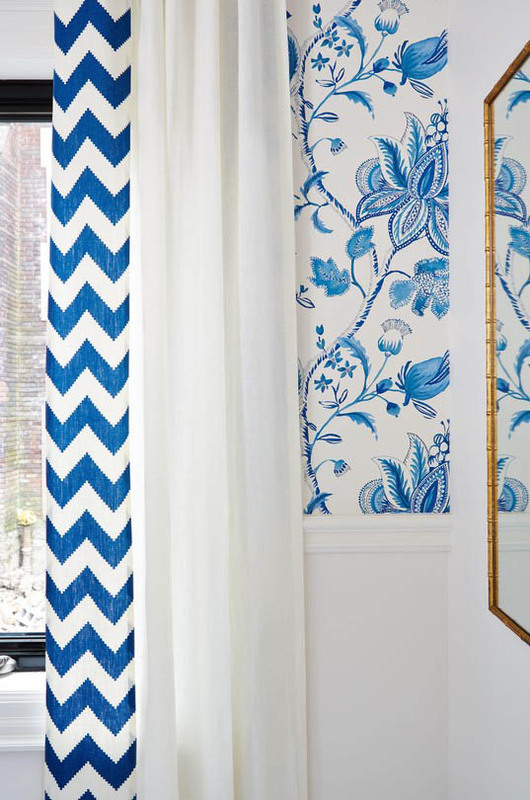 Big doses of white keep the space bright and cheery, while the wallpapered walls bring in the perfect amount of pattern without being overwhelming. Can you tell I love this kitchen? I do. That faucet…the brass cage pendants…the gold mirrored bar cart…seriously, I’m ready to move in now! I think if my mom and I could, we would have multiple kitchens in our house–all designed differently. Really, we just want all of the kitchens. And I really don’t think we’d mind if Sarah Richardson wanted to design one for us. We would gladly accept. (PS. My mom has talked about her desire for a whole house of kitchens in this post here, and also gives some great kitchen design tips!). What’s your favorite part of this kitchen? For more kitchen inspiration…check out our Decor Inspiration Gallery under Kitchens, our own kitchen remodel project, or follow some of our Pinterest boards here or here! The kitchen it lovely, but have a question. Why not take the cabinets all the way up? I was curious about that too, wondering if she was going for more of a “furniture” look. I’m sure she had a reason, maybe she addressed it in the show (which e cannot watch in the U.S.!) I do like that it is so close to the ceiling though, at least it isn’t leaving that big awkward space. Gorgeous!!! I believe I can accurately say I love every room I have ever seen designed by Sarah. I absolutely LOVE this kitchen. That color blue – incredible! The chairs and the wallpaper… Everything flows so perfectly (and classicly). Thanks for sharing this kitchen inspiration. The brass legs of the table and the brass taps completely make it for me!! It’s all very beautiful, isn’t it? I s’poze I’d choose the blue, white + brass color combination as my favorite. Sadly, I prefer Sarah’s old designs to those done in her new “glam” style. I miss the days when she incorporated vintage finds in her kitchens, like old signs, antique corbels, etc. The entire kitchen is gorgeous, but I especially love the lighting fixtures and the wine rack neck to the fridge. My husband and I just demoed our kitchen last weekend. It’s too late to add a wine rack to our design, but I wish I would have thought of that earlier in the design process. Geez, we just got rid of all our brass and gold, and now here it is again. I wish Sarah would get another TV show on HGTV. I miss her! I love the backsplash. 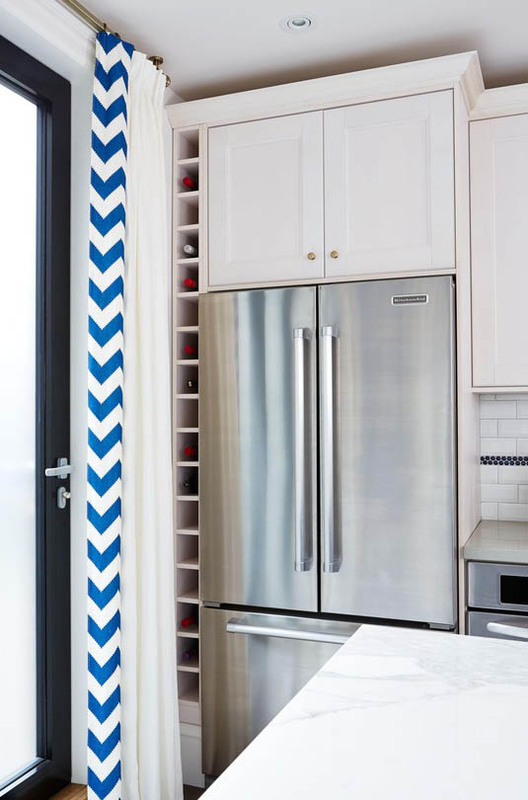 White subway tile is a classic but I love the POP of the coin blue stripes. I don’t have the $ to redo my kitchen but a backsplash and cabinet paint I can do. 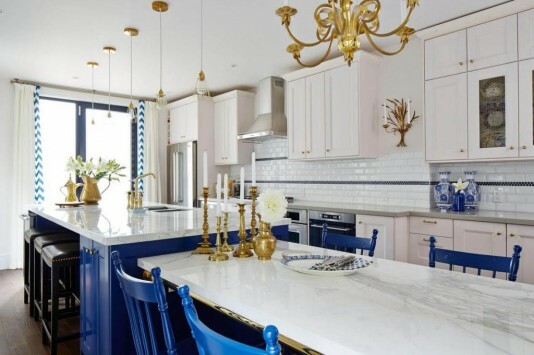 I love the blue, brass and white kitchen! Not really a fan of the wallpaper, though it does look beautiful in pictures. The seams always bug me in person. I think if you have it installed professionally and it is well done you can barely see the seams. I agree, when you can see them it is distracting! Sarah Richardson is such a fabulous designer. I watch her shows more than once and always learn something new. Not so much a fan of Real Potential, but this kitchen is gorgeous. The blue just pops. I love the wallpaper. Hope Melissa feels better soon. I love everything Sarah Richardson! She does do some amazing kitchens. My favorite part of the room are the window treatments. Big surprise there, since they are my first love! Get well soon, Melissa! My hubby has been fighting something since just after Thanksgiving, ick. Anyway, as much as I usually love Sarah Richardson’s designs, I can’t quite decide if I like this kitchen. (Not that I am in any way talented or have a good eye for design, not at all). But I don’t think I’d like living in this kitchen. Trying to figure out why but it has a very cold element to it, I think. Plus after years of Victorian style brass elements in our home, I am not quite ready for it’s return. I do love soft gold accessories and the warmth they bring. I would want your kitchen over this one, truly. Thanks Barbara! I think that is why I always love looking at her designs, she makes me think in new ways! It is easy to love what we see a lot of, but when she does something a little different I sit up and take notes! Thank you for your compliment on my kitchen :-) … and your well-wishes! Hope your hubby gets better soon too! Awww…Melissa take care and have a super speedy recovery. 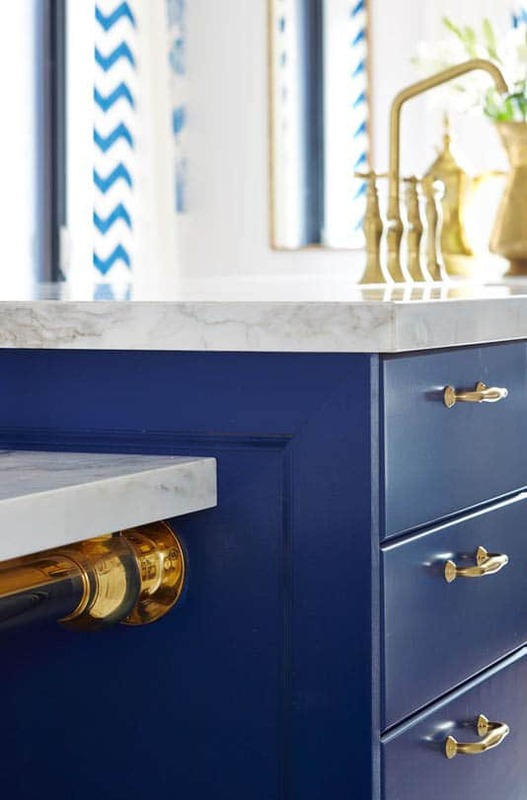 I love the blues and whites….but I’m having trouble with the stainless counter top with the golds. I know we can mix our metals…but it almost feels like two kitchens in one. I’m not sure what about it troubles me. But aside from that, the detailing is terrific. 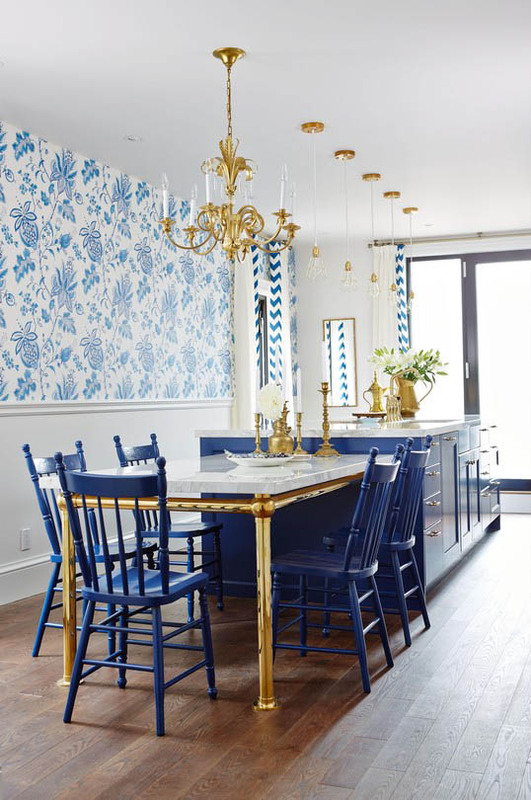 I love the painted chairs, the drapery, and yes…the blue cabinets. Seeing the navy blue makes me think that we’ll be seeing more deep rich blues in home decor. Yes? You two ladies are much more on top of color trends them me for sure! I wasn’t sure what I liked most at first, some parts I loved, some not so much. However, the candlesticks on the table in the last picture really drew me in. Maybe it was the subtle nod to the vintage. I like your mom’s kitchen better. Usually I love Sarah’s work but not this one. 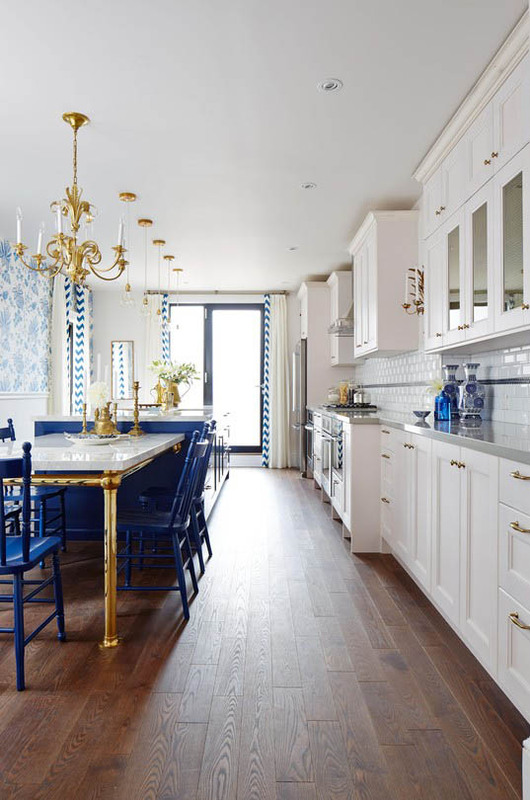 There is too much bright in Sarah’s kitchen – bright white, bright blue and bright brass/gold. I love the cage lights and the chandie but they are fighting each other in this installation. Also I think that the candles mounted above the microwave drawer are strange and out of place. Continuing the type of artwork over the bar cart would have been a better tie-in. Hope your mom gets well soon. Thanks Pamela! :-) I just think of it as a unique fresh kitchen … which is why I think I like it. It makes me think a little bit because it isn’t expected — it’s different. It seems cheery and fun and has a definite personality! Even if I wouldn’t necessarily have thought to make the same choices myself I think there is something about it that is interesting and intriguing. I do get tired of seeing the same materials and designs all the time, so for that, I always appreciate her work and ability to make me think outside the usual combinations!Thanks for your kind words about my own kitchen, I do love how mine turned out so I’m glad you like it too! Sarah Richardson is one of my very favorite designers! 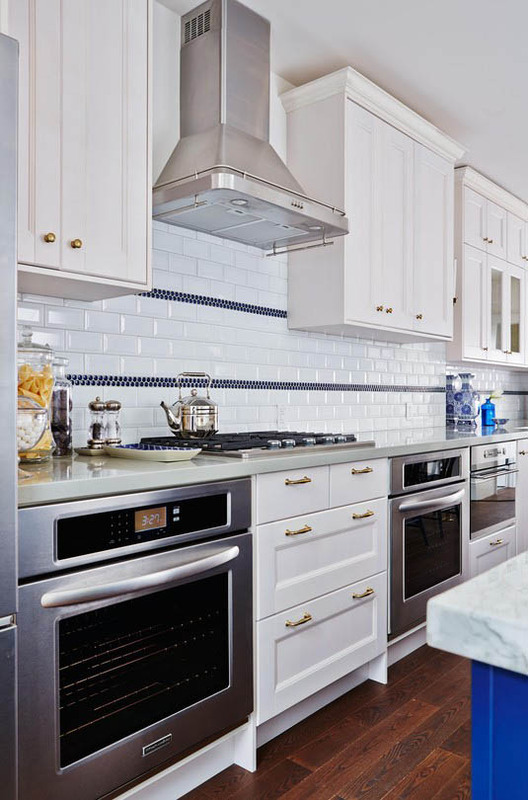 Because I like a mostly white kitchen I like the white tile with the blue border running through – a subtle pop of color. Prayers for a speedy recovery for your mom. I have to agree with Pamela here. I’m surprised because I too usually love Sarah’s rooms, but I really don’t like this. The brass is too hmmm……..brassy? The wallpaper would give me a headache and the ultra-white curtains seem so impractical for a kitchen–at least one that gets cooked in. The layout seems weird to me too. At least from the picture it looks like if you opened the fridge, you’d hit one of those bright white curtains. I’d much rather visit your mom’s kitchen (hope she feels better soon!) than this one. 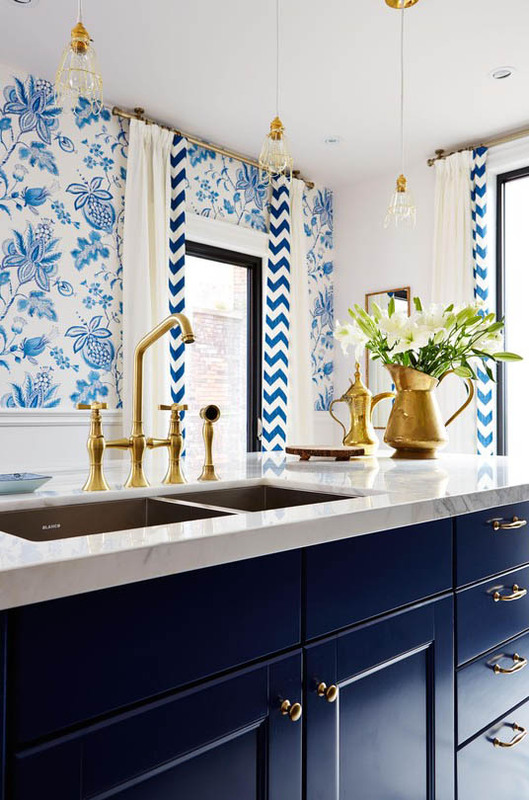 I am not drawn to gold … but I love everything else about this kitchen. And that little almost hidden wine holder … how fun. Hope your mom is feeling better, but glad to hear from you today, too. Wow I was just discussing going navy blue lowers and white uppers in my new house which has to be updated. We were searching fir an example of a navy island and then boom, I clicked on this. Sarah is always ahead of trend and she knows that old gold and brass is the current big thing. Love this post I’m going to study it hard. I’m going with gray, white, navy blue and old gold/brass. So au currant! I LOVE all of the white and the very unique wine holder next to the fridge is great! Although I wouldn’t like these colors for my kitchen at home, I would love to eat in a kitchen like this when going on vacation. It doesn’t feel “homey” to me, more like something to enjoy on a getaway :) Thanks for sharing and well wishes to your mom! I love this kitchen! The pales, whites and neutrals have gotten a little old. Glad to see a brave pop of color that, because of an incredible timeless wallpaper, won’t be too dated very soon. Just gorgeous! I like the blue chairs at the table, though I had to look hard. I vastly prefer my own kitchen and that’s going some. Maybe it’s because I am cold, but the room looks cold. 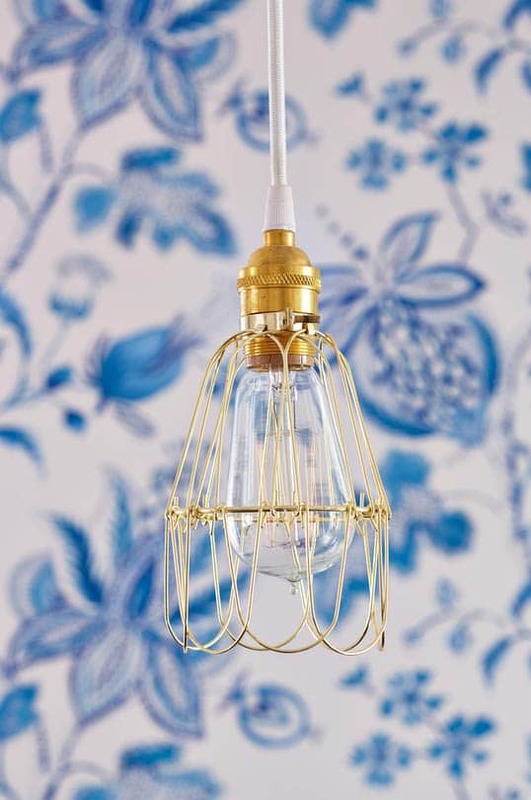 I had a cobalt blue, white and gold fixture kitchen when I built my house. Everyone now says it’s all outdated. Does that mean now the Sarah is using it it’s back in style? I would have saved my money instead of updating. As always everything comes full circle, like clothing. Oh it’s back for sure — Sarah is not the only one using that combination! Yep, everything comes back around whether we loved it the first time or not. And really I think most people tend to gravitate toward what we see a lot of at the moment, because it seems comfortable and most used right now. At the beginning of a popular trend and end of a trend it feels wrong to people, even though it actually might be a classic (like blue & white or brass!) that is just gaining some new fans. But I think if you love something, you can just GO with it whether or not anyone else agrees or not. It is frustrating though when others want to tell you what is in or out! I like the fresh look of this kitchen, especially the use of brass (I never thought I’d say that as an 80’s teen!). I can’t wait to see the episode where she puts it all together, as that’s one of my favorite things about Sarah – being able to see the process. Enjoyed the post! Hope your mom feels better soon. Courtney this is such a fun post! Oh my, that wallpaper is SUCH a throwback to the 80s! I think my mom had the exact same pattern, in navy, red and maroon, in our house! I can’t even believe it’s back. 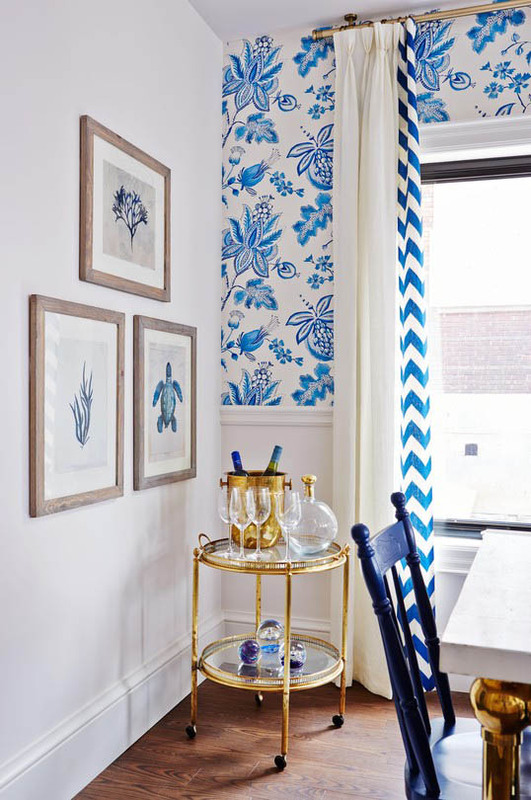 I love the blue & white, and the chevron bordered curtains make the design fresh, but I’m not a fan of the wallpaper nor the brassy gold. However I do love how bold Sarah is, and those blue cabinets with the marble counters are gorgeous! Normally I love Sarah Richardson’s designs, but this one is not moving me at all. And, I have to say it is the brass that is making me dislike it. The brass legs on the counter make me think of the bar in the tv show “Cheers.” I know that brass is trending right now, but I can’t help but think that it will be out of favor in a less than ten years. That’s why I won’t specify it for my clients. There’s a reason why it was only popular in the 80s and didn’t make it into the 90s and beyond. It makes too much of a statement. It screams, “look at me!” Using brass steal the show and takes away from what could have been an exceptional design. She does use a lot of it in one space! Brass has been around forever in design, though, even though silver took over for so long. I think of brass as something old world and more distinguished, like the old hotels I visited in Europe or something you’d find in an antique. It’s always a bit of a shock when old becomes new again, so for many people I’m sure it’s hard to imagine it coming back at all! Ha! I love that table with the brass base. The only tweak I would want is to have it free standing and not attached for more versatility. I am so glad to see brass is popular again. Now my 30 year old lamps are back in style. Para mí es la cocina mas DIVINA Y HERMOSA del mundo!!!! I LOVE the brass legs, but I’m having a hard time finding someone to fabricate them. Anyone know? Sara Richardson is leading the way. Brass kitchen island legs on the cover of October 2016 House Beautiful. Where can I get this faucet from please?